Seasonal cleaning has become a yearly ritual that can take either a day or a week, depending on how long you’ve procrastinated the past year. The free template document that you will find on our site helps you save time by allowing you to create a space in which to create a systematic list of the things that need to be cleaned for the year. The free template couldn’t be any simpler when it comes to customization and when you have the document perfectly structured to fit your home, you can easily print the sheet too. If you’re ready to give this template a try, just follow the guide given below. To download the template file directly to your computer, just follow the link at the bottom of this page. 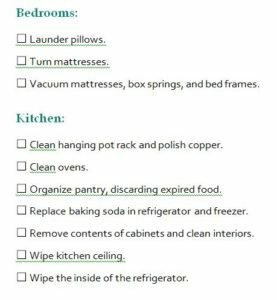 The next step will be to customize the Seasonal Cleaning Checklist to make it fit your home better. Remember, this is a simple Word document so just type the items or delete them as you see necessary. Now, take the time to change the category pages first. This actually serves as the individual rooms of your home. When you have the rooms of your home in place, the next step will be to change the line items below each category to things that you need to accomplish for the season. There are some helpful examples listed, but you can easily change these using the above method. When you have your list fully filled out, you are free to print the sheet for your personal use. Printing is as easy as clicking the “File” button above and then selecting “Print” from the list of options. When you want to clean, just go through your list from room to room and check off your items using the checkboxes to the left.